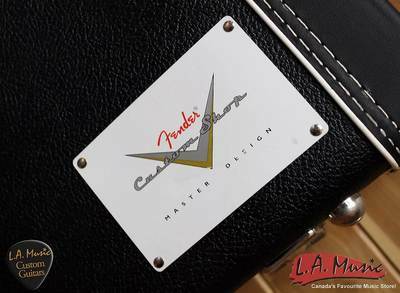 Other Decals, back: Master Design Custom Shop V Logo "Fender"
Blend control offers the neck and bridge pickups together in positions one and five, and all three pickups together in positions two and four. 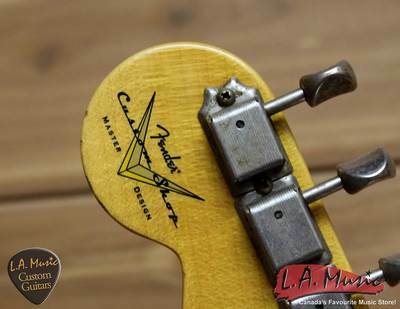 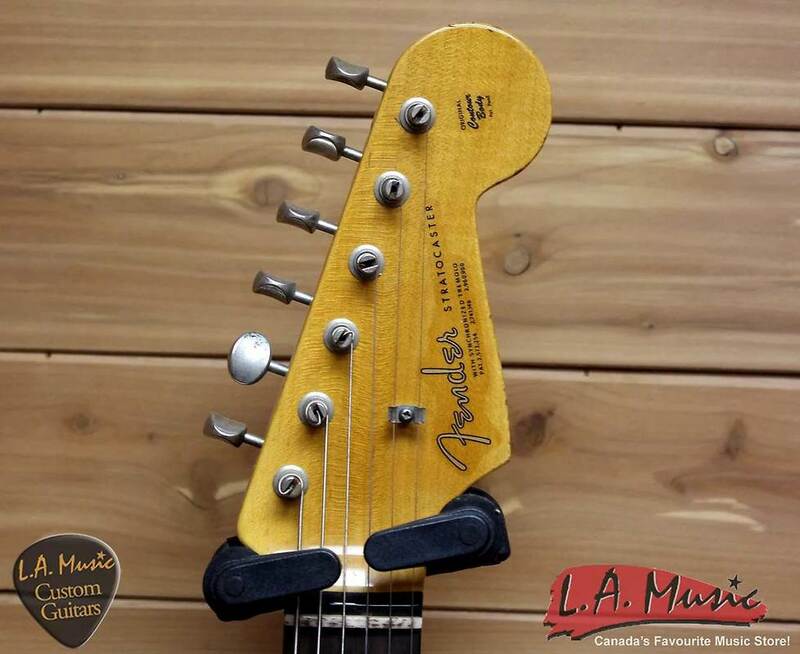 Some models had a "LIMITED EDITION" logo instead of "MASTER DESIGN" logo on neck plate, headstock and case. 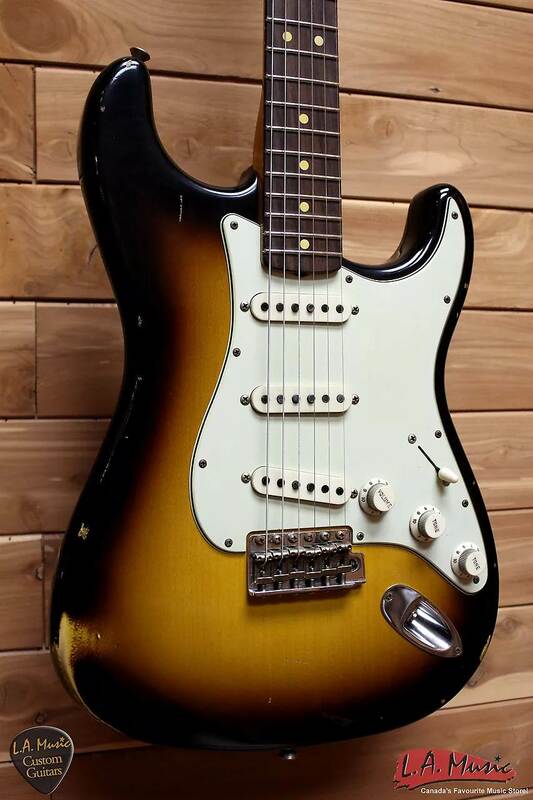 The Fender Custom Shop Master Design 1963 Relic Stratocaster is meticulously designed by longtime Master Builder John Cruz to embody classic early-60s look and soul, with mods under the hood that deliver remarkable modern tonal versatility. 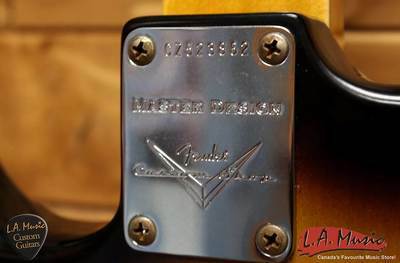 Its special Master Design single-coil pickups provide greater output, more midrange and a sweeter tone for soloing, with a reverse-wound/reverse-polarity middle pickup for hum cancellation in positions two and four. 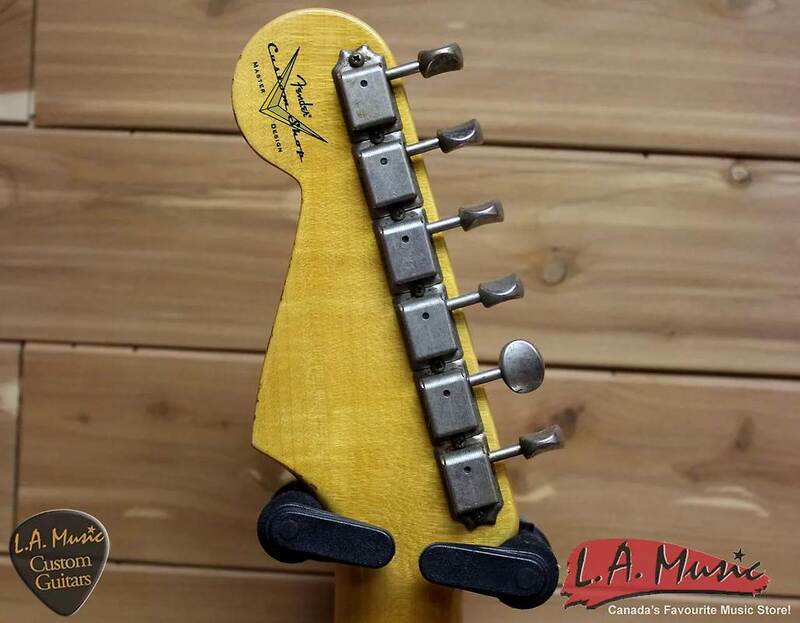 Its custom wiring features five-way switching, master volume control, master tone control and a special blend control built into what would normally be the second tone knob. This blend control offers the neck and bridge pickups together in positions one and five, and all three pickups together in positions two and four. 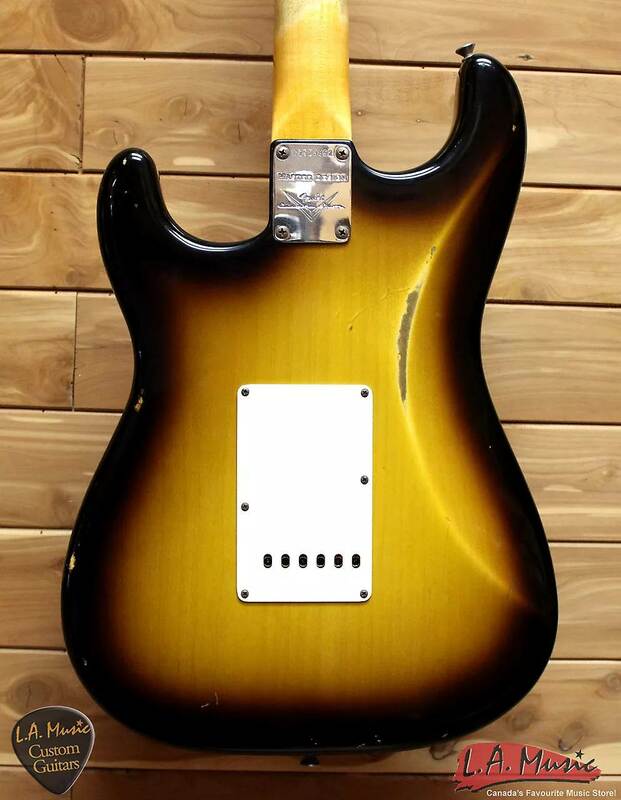 The two-piece alder body has an off-center seam and a faded Two-color Sunburst nitrocellulose lacquer finish that Cruz says "shows signs of period-correct wear without really going over the top." 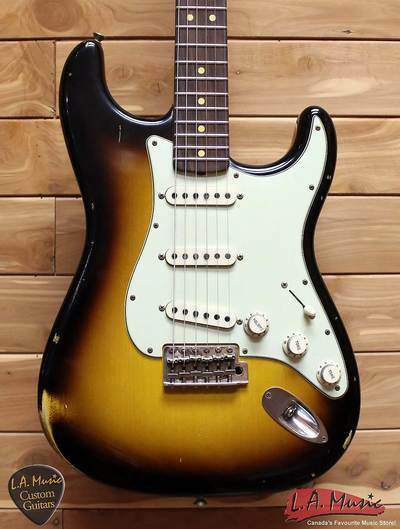 Other premium features include a quartersawn maple neck with a larger "C"-shaped profile and no back finish (for a smooth, fast feel), 12"-radius round-laminated rosewood fingerboard with comfortably rolled edges and jumbo frets, three-ply mint green nitrocellulose pickguard, vintage-style synchronized tremolo bridge with brass block for more overall tonal liveliness, an extra-sturdy larger-diameter trem arm, and nickel/chrome hardware. 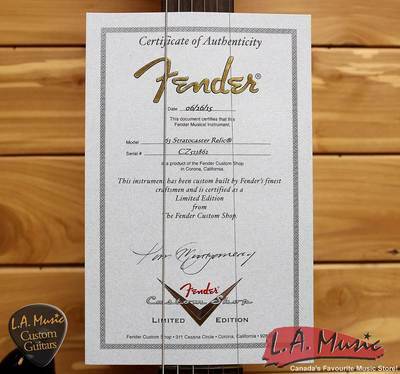 Includes case, cable, strap, tool kit and certificate of authenticity.